Many people are introduced to the sport of rock climbing on single pitch cliffs across the country, a vast majority taking part in group climbing trips such as School, Church, Climbing Gym, Scout Groups or Summer Camp programs. Many will hire an Instructor from a guide service for their first climbing adventure or take a course from a nationally recognized organization. Through the Single Pitch Instructor Program the American Mountain Guides Association wishes to ensure a high standard of climbing instruction is provided in these programs and to attain a high level of safety and enjoyment for the participants while also protecting the finite resource of single pitch crags. High standards are achieved through experience, personal qualities, training and assessment. The 3 to 1 raise, a skill required for the AMGA Single Pitch Instructor Assessment. The AMGA Single Pitch Instructor Program is designed to enable instructors to 'proficiently facilitate and instruct the sport of rock climbing in a single pitch setting'. The program is for current, active rock climbers that have a real desire to teach the rock climbing to novices in a single pitch setting. Candidates should be passionate rock climbers that have their own equipment, regularly climb and have been rock climbing outdoors for at least 12 months. Candidates could be current University Professors that teach climbing, Climbing Instructors, Scout Leaders, Summer Camp Professionals or climbers that wish to achieve additional training, experience and certification to gain employment as a Climbing Instructor in the Outdoor Industry. The SPI Course is not a 'climbing' course. It is an instructor training course for current, proficient and active rock climbers and for climbing instructors who currently teach rock climbing that wish to gain the SPI Certification. The SPI is the first stage of the AMGA's Rock Discipline guide training and certification program and will significantly help candidates that wish to work towards the next stage in the program, the AMGA Rock Instructor Course. The course teaches many instructor specific topics such as professionalism, teaching techniques, risk management, group site organization, climbing site conservation/LNT and assistance/rescue skills. The SPI Program is a three day (27 hour) training course and separate two day (16 hour) assessment. Certification lasts for three years as long as the candidate keeps current AMGA Membership and First Aid Certification. After three years current SPI's can re-take the SPI Assessment to re-gain the SPI certification. 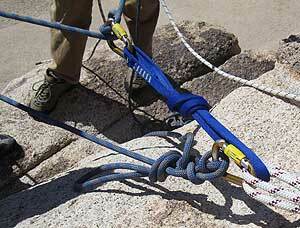 You'll be using the munter hitch during the AMGA Single Pitch Instructor Course and Exam. The SPI Program does not cover multipitch guiding. 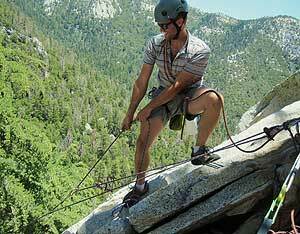 These skills are taught in the AMGA Rock Instructor Course. SPI's that guide clients in multipitch terrain would be guiding outside of their terrain guidelines. Are at least 18 years old at the time of the course. The above pre-requisites are absolute minimums and most candidates have way in excess of the above. Without having at least this amount experience you are unlikely to play a constructive part on the course or be able to make best use of the training. If you are unsure of your skill levels we suggest hiring an AMGA/IFMGA certified guide to evaluate and enhance your skills and experience prior to SPI Program enrollment. 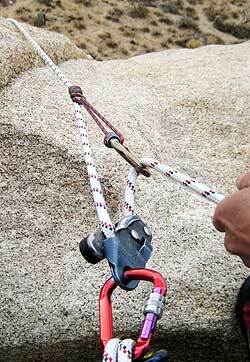 Rigging a top rope with an extended master point is a key concept taught in the AMGA SPI Course. A minimum of 27 hours, normally run as three consecutive nine hour days or day classes with evening sessions. SPI Courses will not exceed a ratio of six students to one current SPI Program Provider. The following three day outline is the standard progression for the SPI Course. Your course may have a different daily schedule and it is acceptable as long as the entire curriculum is covered in your course.The course is normally run over three consecutive nine hour days but as long as all the curriculum is covered over 27 hours the course could be run over separate weekends or even as a semester class. 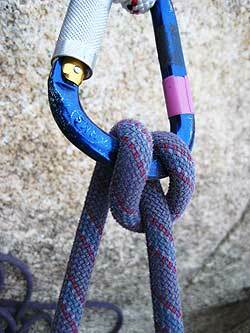 The "climber pick-off" is one of the skills tested during the AMGA Single Pitch Instructor Exam. The course instructor will be Bob Gaines. Bob is the coauthor of Rock Climbing: The AMGA Single Pitch Manual, which is the textbook for the AMGA Single Pitch Program. SPI Assessment Candidate Pre-Requisites The SPI Assessment can be taken directly following the SPI Course if the candidate successfully completed the course and meets the Assessment pre-requisites. However, it is highly recommended that the SPI Course graduate takes time practicing and consolidating the skills learned on the course before assessment (6-12 months). 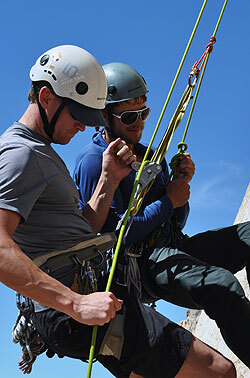 You have successfully completed an AMGA Single Pitch Instructor Course or AMGA Top Rope Site Manager Course. You have trad lead climbed a minimum of 40 rock climbing routes. A large number of these should be at 5.6 grade (or higher) and hopefully at various locations and on a variety of rock types. 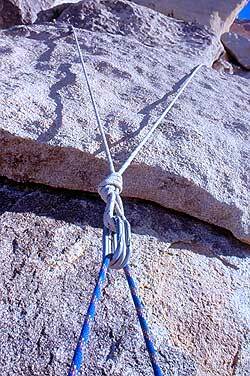 You are capable of comfortably lead climbing any 5.6 traditional routes (leader placing protection). You will demonstrate your leading ability on a variety of routes on the assessment. The 3 to 1 "Z system" is one of the technical components you'll be tested on during the AMGA Single Pitch Instructor Exam. First aid training is not required to take the course or assessment. For the Single Pitch Instructor certification to be valid the AMGA requires you hold appropriate medical certification for the location that you are working in. If you let your medical certification lapse, your AMGA SPI Certification is invalid. It is the responsibility of the individual to maintain appropriate medical certification. SPI Certification is only valid with current AMGA Membership and valid current First Aid Certification. If you let your either of these lapse your SPI Certification is invalid until you rectify this by updating your AMGA Membership or First Aid Certification. It is your professional responsibility to ensure you have a current AMGA Membership and First Aid Certification. Certified Single Pitch Instructors can take the two day SPI Assessment to renew their certification. Certified Single Pitch Instructors who successfully complete any higher level AMGA course is granted SPI certification for three years from the course end date. After completing a course, please contact the AMGA so they can update your records. To keep SPI Certification current SPIs should seek out re-certification before the expiry date of their certification. Candidates that let their certification lapse can take part in the SPI Assessment but they will not hold any certification between their SPI expiry date and successfully passing an SPI Assessment. From a professional standpoint this is not advisable. Extremely experienced candidates can apply to the SPI Discipline Coordinator for exemption from training and take the SPI Assessment without completing an SPI Course. Before considering this option one should realize that ongoing training and having a chance to work with your peers in a course environment is invaluable for all instructors at anytime in their instructing career. Skills taught are instructor specific and many topics taught in the class are updated annually as new techniques, equipment and philosophies come to light. The SPI Assessment is a minimum of 16 hours. The Assessment should be run over a two day period. Candidates that meet the Assessment prerequisites can take the Assessment directly following the Course if they desire although this is not recommended. Munter/mule demonstration during AMGA SPI Course at Joshua Tree. The assessment examiner will be Bob Gaines. Bob is the coauthor of Rock Climbing: The AMGA Single Pitch Manual, which is the textbook for the AMGA Single Pitch Program.